It is our innermost human prerogative to find ourselves in the world... as the world. More than tools for directing broad brushstrokes which attempt to capture and tame the grandeur of the Canadian wild, these hands seek to hold a feeling, the essence of a place in a timeless moment. Each panel of this pictorial composition is initiated on site, where light streaming through a stormy sky is the artist’s own perspective, where the unique view from the waterline provides a rich reservoir from which to decipher color, form, line, scale and subtle aesthetics. Sitting on the ground, hearing nature’s rhythms, feeling the natural play of sun and wind, earth’s own passion is deeply shared in this translation of light shifting across the landscape as the planet tips through the circle of the seasons. It is in this authenticity, this deep connection, where nature is found to be identical with the peace of our own human nature. Catching the Aqua Teal colors in the Early June sun. 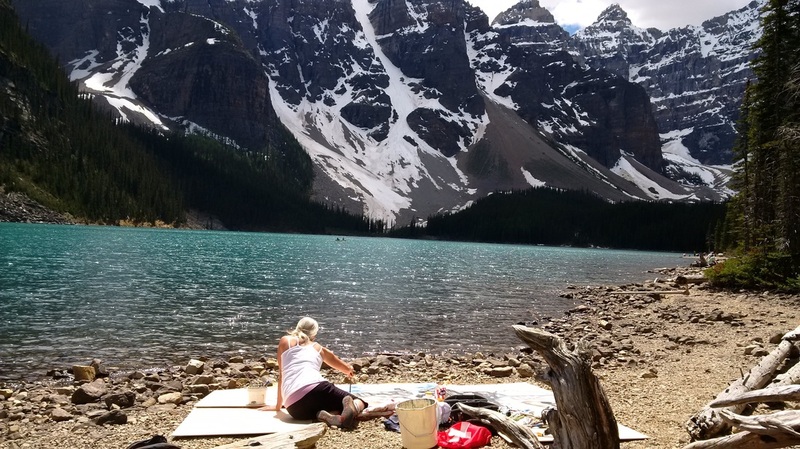 Laying out panels and getting started at Moraine Lake. ​After a long day of painting, paints, brushes and panels are packed up and hauled back to the trail head. A short video of my sherpas transporting panels to the site for me. Thanks to my brother in law Niels, my sister Cathy, my son Brody and my husband Dirk. The far right side of the painting transitions into the Valley of the Larches. During the time when the larches turn color, the traffic is limited. We chose to beat the traffic and head up to the location at the beginning of September. 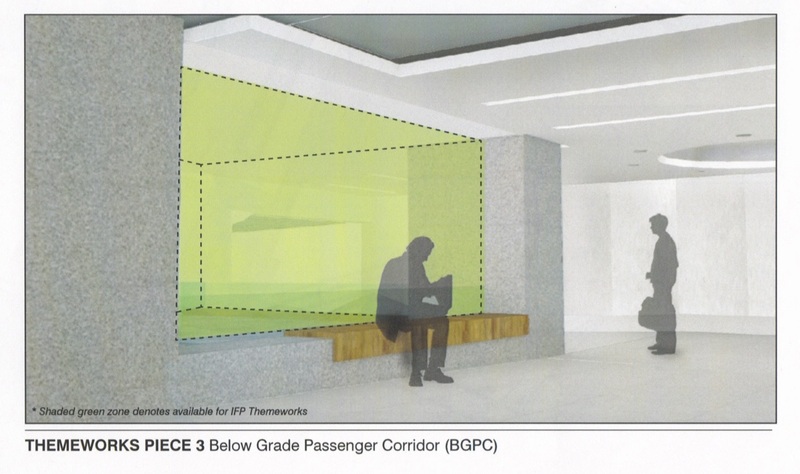 In some cases, the large panels are placed on the trail where the best view and space is available. Hikers are redirected around the work in progress as the picture on the left shows. 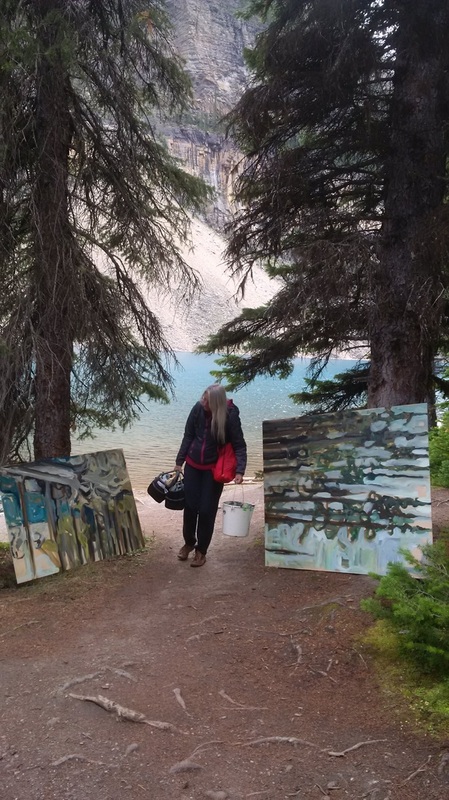 The same paintings are brought back to the studio where the rich warm colors of the larches are added and where the paintings are finished. 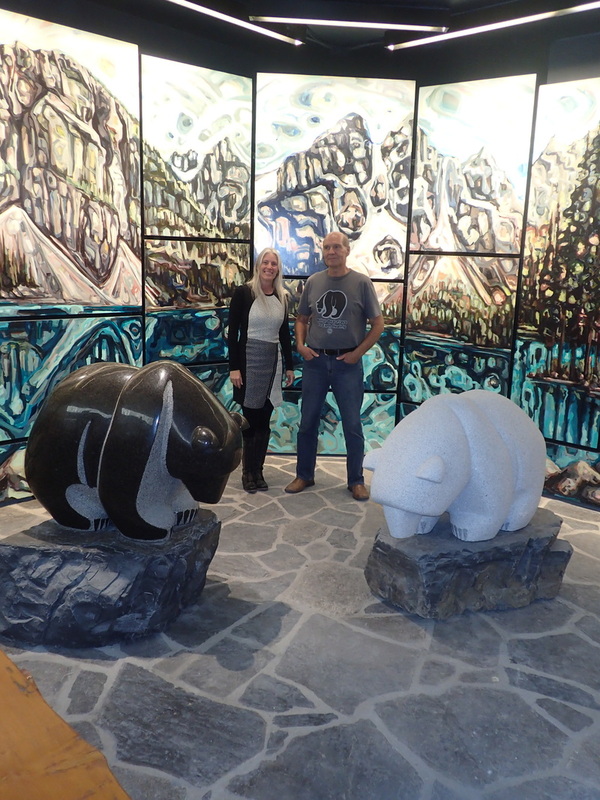 Sandy Kunze admits to some confusion when Bruce McFarlane first raised the possibility of doing art works for the Calgary International Airport. Open to the public coming from P2 parking up the pedway to the airport terminal. 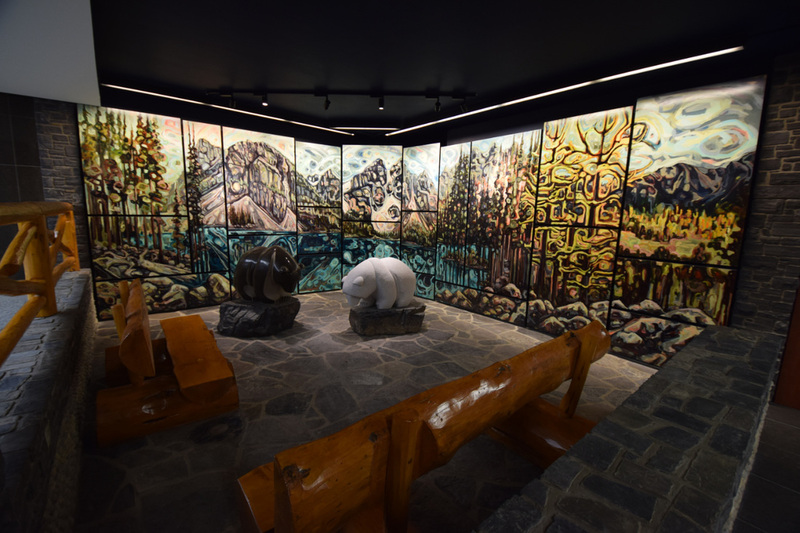 The finished background art-work and sculptures are in place to be viewed by the public. 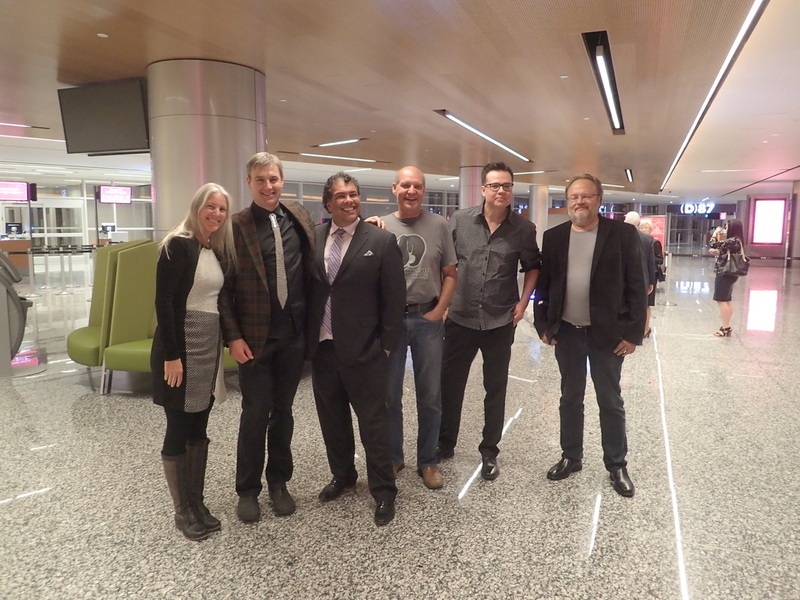 The artists showing in the New Airport Terminal and the Mayor of Calgary. 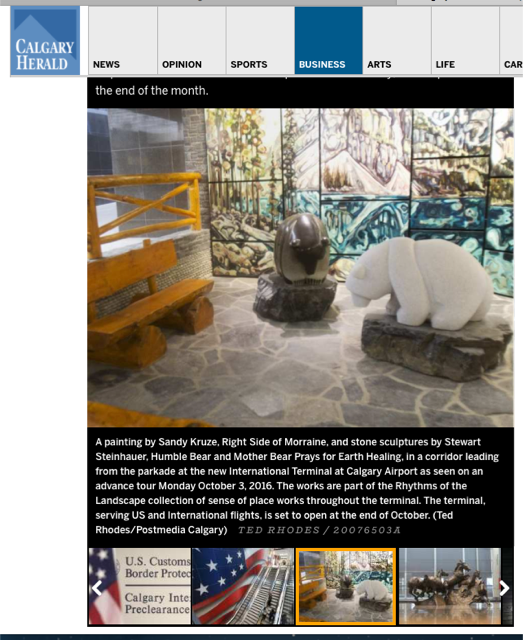 Sandy Kunze painter, Jeff de Boer sculptor, Mayor Naheed Nenshi, Stewart Steinhauer sculptor, Jason Carter painter, Michel Mailhot glass artist.